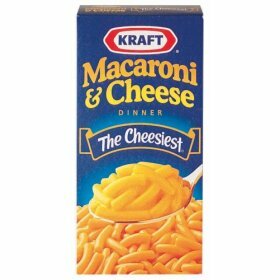 Growing up, one of the staples around our house was Mac&Cheese. Not just any M&C, but the blue box kind. You know what I’m talking about. The kind that starts with “K”, and ends with “T”. Ok, ok, I’ll say it…Kraft. There, now they’ll probably sue me. But anyway, I ate so much of this beautiful blue box of goodness, my grandpa would say, “Boy, you’re going to turn into a big noodle one day.” And oddly enough, that didn’t bother me. So I went off to college, and low-and-behold, I realized that the blue box would save my life! Cheap food = good. Between M&C and ramen, I made it through college not too undernourished. In fact, I still eat it quite often, and seem to have passed the blue box syndrome on to at least one of my boys. As good as it is, though, it could be better. So, today, I’m going to share my “recipe” to make the blue box even better. It adds no more than a few cents to the price, too. I put that in because I’ve seen how some people leave the cheese powder out, and put Velveeta, or even stinky-foot-cheese (no accounting for taste in some people) in their M&C. To me, that’s going a little overboard. If you’re going to do something that fancy, just make the stuff from scratch. My way, though, is quick and easy. First, you put some water onto boil as you normally would. I like to add a little Kosher or table salt to the water (about 1 TBL or so), but it’s not strictly necessary. When the water’s boiling good, open your box, and pour in the macaroni. I know it sounds stupid, but remember to pull the cheese pouch out first. You don’t know how many times in college I heard someone scream from another room because they dumped their cheese pouch into the pot of boiling water, and reached in to grab it. Of course, we’re talking about college guys, here, not the top of the brain game. Watch the macaroni to prevent boil-over and remember to stir it occasionally. Anyway, while the macaroni is boiling get out a medium sized bowl and into it put 2 TBL butter or margarine, and one slice of American cheese. That’s right, a slice of cheese. I definitely prefer American, but you can substitute any favorite cheese, as long as it melts easy, and creamy. Sharp cheddar doesn’t work well for this. Too many lumps. Cut up the butter and cheese into pieces. This makes it warm up faster and melt easier. As an alternative, you can leave them out for about 20-30 minutes before you start cooking to get them up to room temperature, but I’m too impatient for that crap. Once the macaroni is done (you’ll know by fishing a noodle out of the water and eating it), take the pot off the burner, put the pot’s lid on, and drain the macaroni as much as possible. DON’T BURN YOURSELF !!! If you do, don’t bother suing me, since we don’t have anything but Mac&Cheese. Once the water has dripped to nothing, pour the macaroni into the bowl over the butter and cheese. Now, stir the macaroni, butter, and cheese until the butter and cheese are completely melted, and blended well. Next, pour in about half a can of Carnation Evaporated Milk. I love this stuff for cooking. Since it’s in a can, it keeps forever. I don’t have to worry about it spoiling, spontaneously gaining sentience, and bolting away when I try to cook it. Umm, not that it’s ever happened before, of course. So anyway, use the small 5 oz. cans. Any evaporated milk will do, I just like Carnation. Since it’s basically concentrated milk, it makes the M&C richer and creamier. Once you’ve poured about half the can in there, open up that wonderful cheesy happy powder pouch, and pour it into the bowl. Stir it in slowly, making sure to get the cheese distributed evenly. Depending on how much water you left in the macaroni, you may need to add a little more evaporated milk to get it just right. What’s ‘just right’, you say? Well, how should I know? What do you like? If you like lots of cheese sauce going all over the place, put the whole can in. I usually end up using about 3/4 of the can. You can refrigerate the rest, throw it out, drink it, throw it at neighborhood kids, or whatever. Now for the best part. If you did it right, there should be a little bit of gooey cheese powder on the spoon. Lick it off. Oh my. Good, isn’t it? There! A big, steaming bowl of cheesy goodness guaranteed to lighten your day. Eat it all. Don’t save any for anyone else. You made it, you eat it!